“Frame #12, Western” is stamped with black Memories on white card stock and colored with pencils. 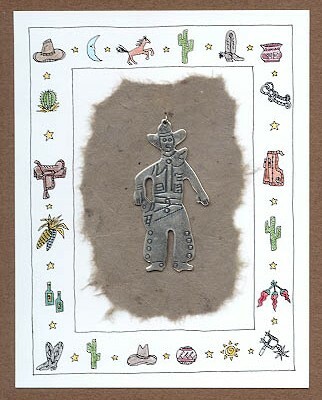 A cowboy charm is placed on torn handmade paper and layered onto the stamped card which is layered on tan card stock. Card is by Mary Connaway who, also, drew the frame.